July 16, 2015 July 16, 2015 / Steve M.
The first issue of Merlin—initially subtitled A collection of Contemporary Writings was published in the Spring of 1952. It was edited by Alexander Trocchi, and published by his American girl friend Alice Jane Lougee. Five further issues under this editor/publisher combination would follow. 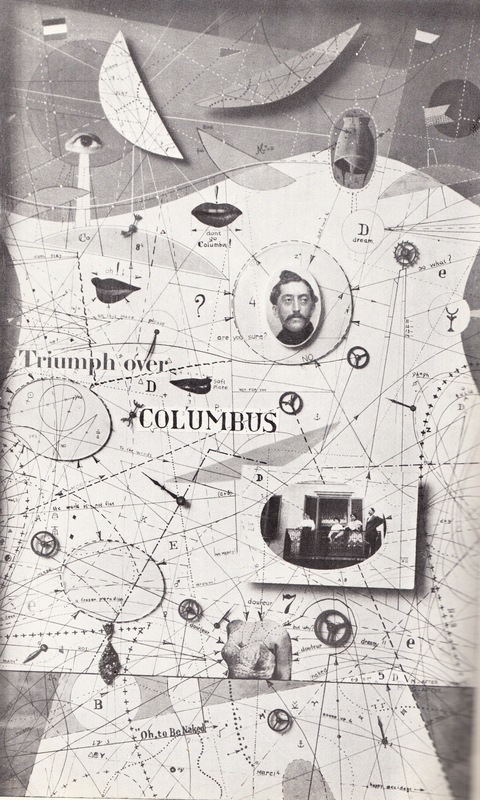 The seventh and final issue was published by the Olympia Press, described in detail below. In view of the important connection between Merlin, its contributors and editorial personnel, and the Olympia Press, a brief summary of the non-Olympia issues is given. The names of contributors or the titles of works-in-progress are limited to those with known Olympia Press affiliations. No. 1 [Vol. 1, number 1, Spring 1952.] Printed by Impr. Mazarine. Contributions by Christopher Logue, Alfred Chester and Alexander Trocchi. No. 2 [Vol. 1, number 2, Autumn, 1952.] Printed by Impr. de la S.A.I.B.E.L, Fontenay-aux-Roses (Seine). Contributions by Patrick Bowles (credited here as P. W. Bowles), Christopher Logue and Richard Seaver. No. 3 [Vol. 1, number 3, Winter 1952-53.] Printed by Arrault et Cie, Tours. 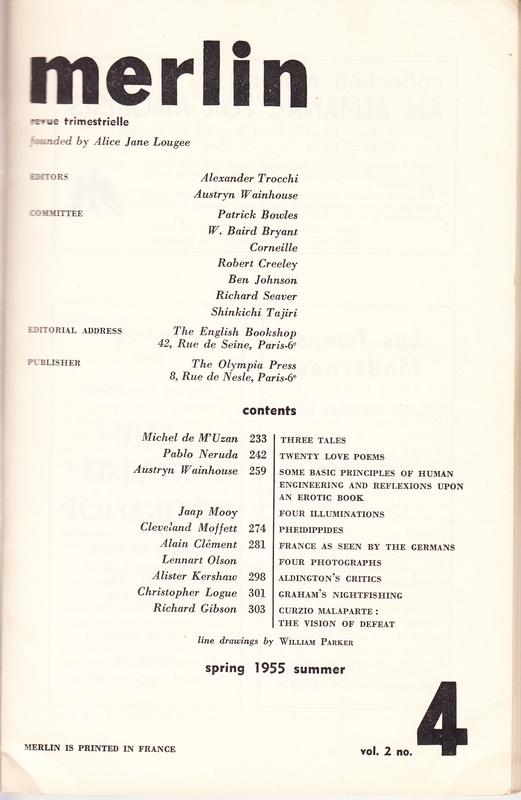 This issue is additionally described as a Revue Trimestrielle and Richard Seaver is credited as Advisory Editor and Director. Contributions by Samuel Beckett [extract from Watt], Austryn Wainhouse [extract from Hedyphagetica.] and Richard Seaver. No. 5 [Vol. 2, number 2, Autumn 1953.] This issue was printed in Spain, and no printer is given.Seaver’s role in the proceedings become Assistant Editor & Editor. John Coleman is credited as Business Manager. The editorial address becomes 42, rue de Seine, Paris 6, which was the English Bookshop. The first advertisements for Collection Merlin and the Olympia Press appear in this issue. For Collection Merlin the titles listed are Beckett’s Watt and Logue’s Wand and Quandrant, with Hedyphagetica by Wainhouse and Molloy by Beckett To be published. The Olympia Press offers Justine by the marquis de Sade and Plexus by Henry Miller. Despite the editorial address for Merlin being on the rue de Seine, the address given for both Collection Merlin and the Olympia Press is 13, rue Jacob, Paris 6. Contributions by Logue, Beckett [extract from Molloy], Brassaï [i.e. Jules Halasz; four photographs, with a note by Seaver] and Wainhouse. No. 6 [Vol. 2, number 3, Summer/Autumn 1954.] Printed by Impr. Richard, 24, rue Stéphenson, Paris 18. Seaver, Wainhouse, Bowles and W. Baird Bryant are listed as Associates, and John Stevenson is credited as Business Manager. The editorial address remains with the English Bookshop on rue de Seine. 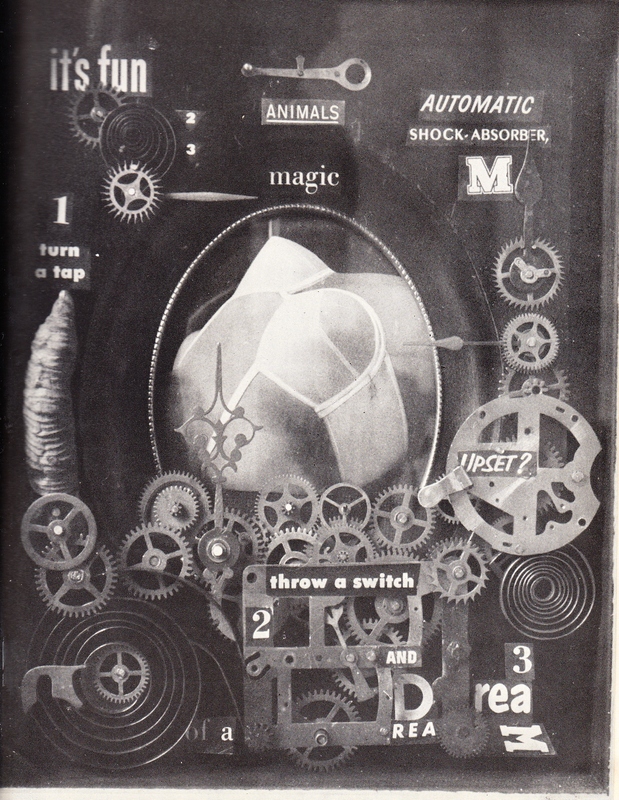 A full-page advertisement for Collection Merlin offers Beckettřs Watt, Logue’s Wand and Quadrant, Jean Genet’s The Thief‘s Journal and Wainhouse’s Hedyphagetica. Beckett’s Molloy is announced for Autumn publication. There is a half-page advertisement for the Olympia Press that offers no specific titles, but Books in English of lasting value. This is the last issue of Merlin to be published by Alice Jane Lougee. Contributions by Beckett [The End, translated by Seaver in collaboration with Beckett], Trocchi and Patrick Bowles. Collation: 80 pp. No signatures, but [1-5]8, with the numeration of the pages following on from previous issues of the periodical. Two double leaves on coated photographic paper (comprising photographs by Jaap Mooy and Lennart Olson) are inserted between pp. 260,261 & 276,277 and between pp. 292,293 & following p. 308. 24 x 15.4 cm., all edges trimmed. Printed on white wove paper. 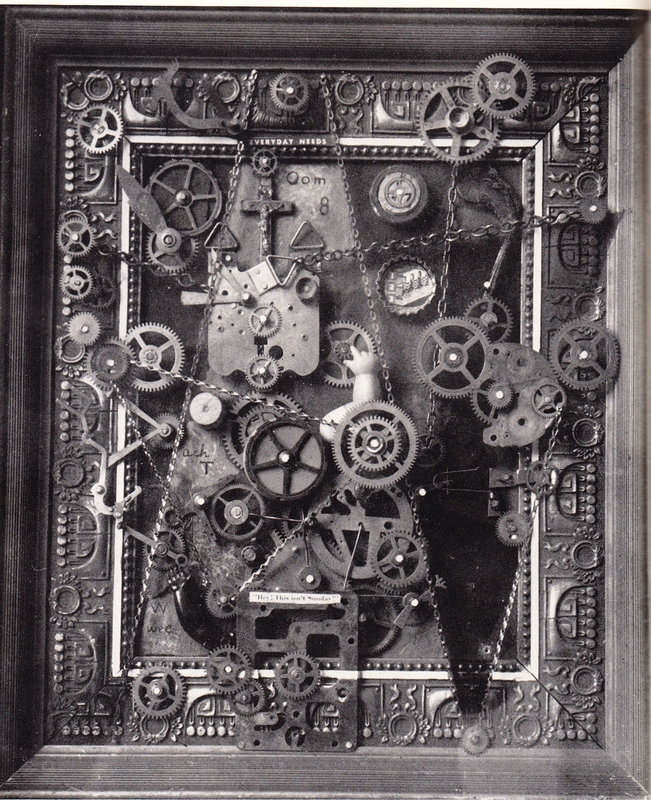 (Christopher Logues The Weekdream Sonnets, published by Jack Straw), 30(Collection Merlin/Olympia Press, and Samuel Beckett’s Molloy specifically) and 308 (Merlin). Binding: Printed card wrappers, with orange front and spine, spilling over to a 1-inch band on back. Remainder of back wrapper is white. 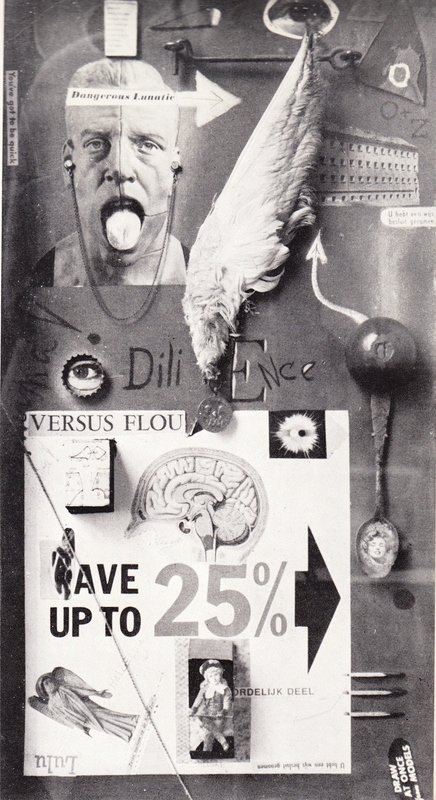 Front cover: [centred at head in white l.c. large type:] merlin | [centred below title in smaller l.c. 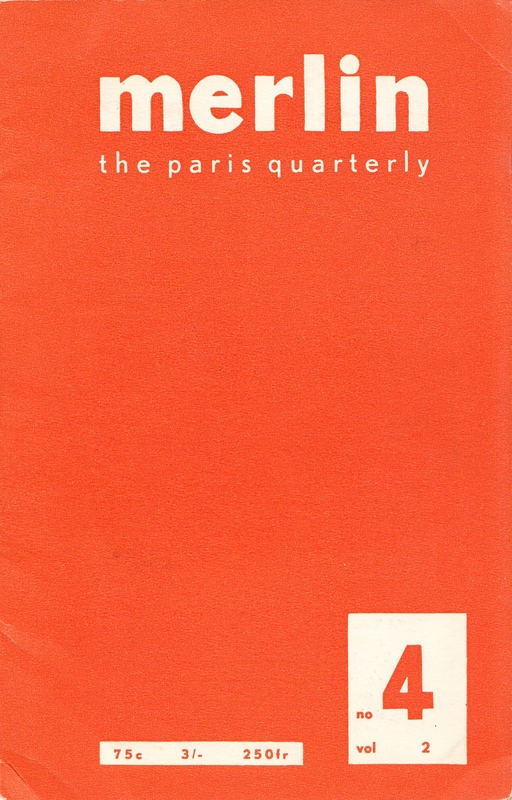 type:] the paris quarterly | [at foot, slightly to the left, and in orange within a thin white panel:] 75 c [space] 3/- [space] 250fr. [At foot and to the right, in orange within a larger and oblong white panel:] no [large] 4 | [small] vol 2. Spine: [at top of spine, reading down in widely-spaced white l.c. :] merlin. 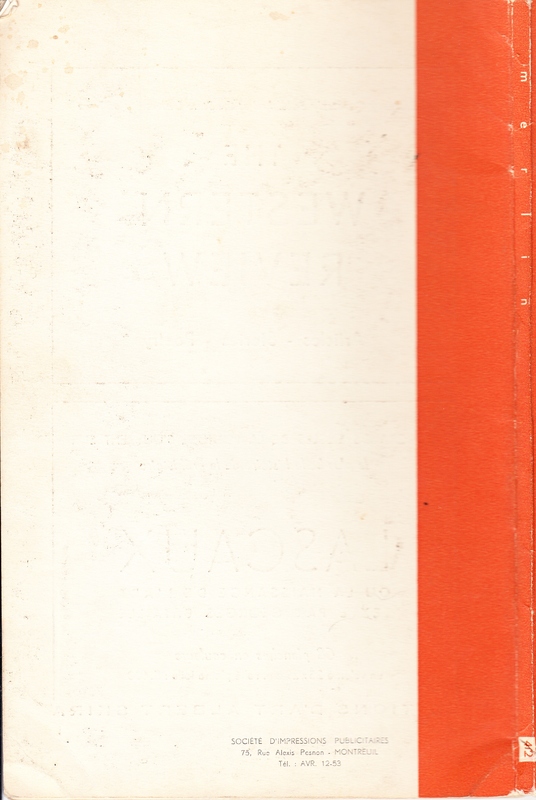 [At foot of spine, reading down in orange type within white panel:] 4/2. Back cover: [at foot and to the right of white section:] SOCIETE D’IMPRESSIONS PUBLICITAIRES | 75, Rue Alexis Pesnon MONTREUIL | Tel. : AVR. 12-53. The inside front wrapper carries an advertisement for Merlin comprising lists of contributions promised for later issues and available back issues. The inside back wrapper carries two half-page advertisements, the uppermost for The Western Review, a literary quarterly published by the University of Iowa, and the lower for Lascaux, ou la Naissance de l‘art, an art book with text by Georges Bataille published by Albert Skira. ← New into the Collection: Scream my Darling Scream, Angela Pearson, Odyssey Library Copenhagen 1963.